I have your letters of the 16th and 21st. There are many days when you dont write. What do you do, then? No, my darling, I am not jealous, but sometimes worried. Come soon; I warn you, if you delay, you will find me ill. Fatigue and your absence are too much. Your letters are the joy of my days, and my days of happiness are not many. Junot is bringing twenty-two flags to Paris. You must come back with him, you understand?  hopeless sorrow, inconsolable misery, sadness without end, if I am so unhappy as to see him return alone. Adorable friend, he will see you, he will breathe in your temple; perhaps you will even grant him the unique and perfect favor of kissing your cheek, and I shall be alone and far, far away. But you are coming, arent you? You are going to be here beside me, in my arms, on my breast, on my mouth? Take wing and come, come! I have received your letter, my adorable friend. It has filled my heart with joy. I am grateful to you for the trouble you have taken to send me the news. I hope that you are better today. I am sure that you have recovered. I earnestly desire that you should ride on horseback: it cannot fail to benefit you. Since I left you, I have been constantly depressed. My happiness is to be near you. Incessantly I live over in my memory your caresses, your tears, your affectionate solicitude. The charms of the incomparable Josephine kindle continually a burning and a glowing flame in my heart. When, free from all solicitude, all harassing care, shall I be able to pass all my time with you, having only to love you, and to think only of the happiness of so saying, and of proving it to you? I will send you your horse, but I hope you will soon join me. I thought that I loved you months ago, but since my separation from you I feel that I love you a thousand fold more. Each day since I knew you, have I adored you yet more and more. This proved the maxim of Bruyere, that "love comes all of a sudden," to be false. Everything in nature has its own course, and different degrees of growth. Ah! I entreat you to permit me to see some of your faults. Be less beautiful, less gracious, less affectionate, less good, especially be not over-anxious, and never weep. Your tears rob me of reason, and inflame my blood. Believe me it is not in my power to have a single thought which is not of thee, or a wish I could not reveal to thee. Seek repose. Quickly re-establish your health. Come and join me, that at least, before death, we may be able to say, "We were many days happy." A thousand kisses, and one even to Fortuna, notwithstanding his spitefulness. I write you, me beloved one, very often, and you write very little. You are wicked and naughty, very naughty, as much as you are fickle. It is unfaithful so to deceive a poor husband, a tender lover! Ought he to lose all his enjoyments because he is so far away, borne down with toil, fatigue, and hardship? Without his Josephine, without the assurance of her love, what is left him upon earth? What can he do? We had yesterday a very bloody affair; the enemy has lost many men, and has been completely beaten. We have taken the whole country around Mantua. TULARD: What is extraordinary is that in this passion we have Napoleon's letters to Josephine that she kept, but we don't have her letters to Napoleon. So either he didn't keep them and that would make his passion a little more lukewarm in a way or maybe Josephine didn't write to him or would write just very neutral letters. The latter version is the one I would adopt. CHEVALLIER: Contrary to popular opinion, Josephine is submissive. Very calm and gentle and she was Bonapartes haven of peace. Her only defect was she was a bit jealous and sometimes she would cry for nothing, but he would be able to come here to his wife and find a home and tranquillity. She was always ready to serve him. Sometimes she would be dressed in her best and she would be there with her entourage and wait for him to finish work. She was very soft and very gentle, which was important for Napoleon because she was the contrary of what he was. During the First Italian Campaign Napoleon began to hear the rumors that Josephine was being unfaithful to him in his absence. He denied these rumors, even to himself, and his letters became even more passionate in response. I kiss it a thousand times and wait impatiently for the moment I will be in it. To live within Josephine is to live in the Elysian fields. Kisses on your mouth, your eyes, your breast, everywhere, everywhere. Six days later he returned to her apartment in Milan, only to find it empty. Josephine had left for Genoa  most probably with army officer Hippolyte Charles, with whom she was suspected of having an affair. He waited nine days for her return, but the wait began to arouse his suspicions. Yes, my Hippolyte, my life is a constant torment! Only you can restore me to happiness. Tell me that you love me, that you love only me! Adieu, I send you a thousand tender kisses... and I am yours, all yours. They see my regrets, my hopelessness at being deprived of seeing you as often as I desire to. Hippolyte, Ill kill myself. Yes! I want to end a life which from now on can only be burdensome to me if it cannot be consecrated to you. Following this "day of the catastrophe," as she referred to it, Josephine must have contemplated what life would be like if Napoleon did divorce her. Her behavior from this point forward was much more amiable and loving towards Napoleon, and she appeared more willing to accompany him on his campaigns despite an overwhelming fear of carriage travel. Just the opposite could be said of Napoleon, however. Following this confrontation he realized Josephine could no longer be trusted, and his love began to turn to resentment. CHEVALLIER: I think that then passion becomes a little more dormant in Napoleon, and he doesnt write these absolutely passionate letters to her. He writes wiser, calmer letters and from then on they become accomplices, very close and intimate because while he is in Egypt, she has prepared the coup. She invites the directors and leads them to admit that the return of her husband would bring about a new situation in France, and she has played an important role so, in fact, they grew up together in a way. Of course their relationship changed. They had no more couple relationship. I need to be alone. I am tired of grandeur; all my feelings have dried up. I no longer care about my glory. At twenty-nine I have exhausted everything." Unfortunately, this letter was captured by the British, who gleefully published it in the London papers. 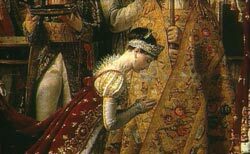 Now all of France knew of Napoleons changed feelings for Josephine. Mortified, she hid herself at Malmaison. 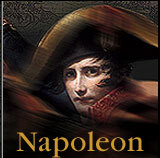 Napoleon finally returned to France in October 1799, after a year away. Josephine tried to intercept him on his return journey, but they missed each other in travel and when he arrived at her house she was not there. He ordered servants to take her possessions away. When she finally arrived she was at first refused entry, but she pushed past the servants and ran to Napoleons room, where she collapsed outside his locked door, weeping. The accusations, pleas and shouting lasted for hours, but by dawn they were in each others arms again. Josephine would never take another lover, but from that point on Napoleon felt free to do as he pleased with other women. In February 1800 Napoleon became First Consul, and the couple moved into the Tuileries Palace. Napoleon began to flaunt his mistresses. "I am not a man like others and moral laws or the laws that govern conventional behavior do not apply to me. My mistresses do not in the least engage my feelings. Power is my mistress." The couple was crowned Emperor and Empress in 1804, and lived peacefully for two years.